Two months ago, I had a good traveling in Japan and China. I brought my laptop with me, I try to connect internet while I traveling anywhere. Unfortunately, I found some secured wireless signals in Japan, but no in China. 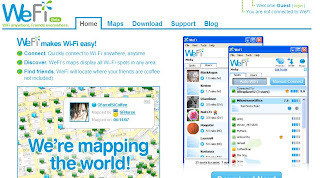 Wefi is a website that offers a software makes people find wireless hotspot easier than before. You can download a software from Wefi into your laptop, and it will show you some hotspots wherever you go. It gives you a map, and shows you hotspots around the world. I think that depends on how many users, more users more hotspots information.